Situated on 5 acres of gardens with 33 rooms and suites spread out in 5 historic buildings including the main mansion, a Greek revival style Antebellum home with 13 rooms on 4 floors including the basement and attic. Restaurant and pool. 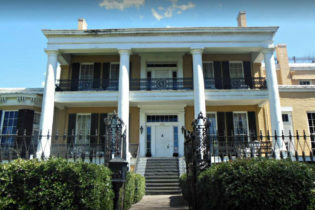 This fine Vicksburg, Mississippi Antebellum Estate is one of the largest and most elegant bed and breakfasts in the South. Situated on five acres of gardens, this historic mansion inn specializes in creating a warm, elegant atmosphere perfect for the business traveler or honeymoon couple and is consistently voted Best Bed and Breakfast in Vicksburg. Known for our elegant rooms and warm hospitality our staff takes pride in ensuring each guest enjoys their stay in any of our 33 rooms and suites spread out in five historic buildings. We invite you to make reservations in our romantic candle lit restaurant and bar! For those seeking the perfect location for a Southern wedding, Cedar Grove has one of the most beautiful outdoor wedding locations in all of Mississippi coupled with the best cuisine offered in our region. So come enjoy our gardens, rooms and suites, in-house restaurant and lounge and friendly staff on your trip through Vicksburg. Visit our webpage and go to the Virtual Tour powered by Google and visit us on Facebook.